Alternative investments are on the rise. In an era of increasing geopolitical turbulences, where interest rates are low and equity markets are close to their all-time highs, well informed investors are actively looking for investments that can provide a hedge against volatility. Since the financial crisis, diversifying portfolio by opting out of equity and fixed income is one of the methods of reaching returns that would not necessarily be linked to the zero-bound interest rate policy of Central Banks. In an era of increasing geopolitical turbulences, where interest rates are low and equity markets are close to their all-time highs, well informed investors are actively looking for investments that can provide a hedge against volatility. For this reason, alternative investments are becoming more appealing for investors seeking for diversification and returns uncorrelated to traditional markets. This mean that alternative investments, such as real assets or precious metals, generally outperform stocks and bonds when these ones are crashing. Underserved customer segments and increased demand for unconventional investment products, combined to the improved financial literacy can represent an ideal opportunity for fintech startups, given their flexibility when compared to traditional financial institutions. 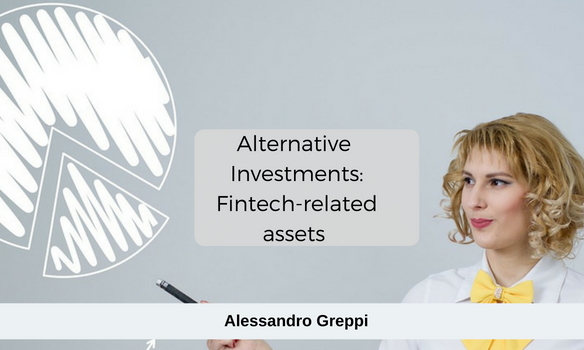 As a matter of fact, thanks to the increasing offer of fintech solutions, the segment of alternative investments in the last years has been joined by cryptocurrencies, P2P lending, invoice trading, equity and real estate crowdfunding. Some of the most famous cryptocurrencies are bitcoin, ethereum, litecoin and monero. This asset class is one of the hardest to deal with because of its high volatility. Nowadays, we can't consider cryptocurrencies as a natural hedge against financial markets turmoil because in the last period their dynamic seems to be correlated to equity markets. However, in the past years they also acted as an insurance against negative events because their price spiked while the other markets were collapsing. For this reason, they should be studied carefully before opening any position. P2P lending is an innovative financing method that enables individuals to borrow and lend money outside of the traditioanl banking channel. In the lst years, the rise of P2P lending eroded market-shares to low-yielding saving accounts. However, investors should consider that lending process carries some risks but starting slowly and from smaller amounts can help them to diversify a portfolio. Among the most successful P2P lending platforms there are: Lending Club, Prosper, Upstart and Funding Circle. Invoice trading allows firms to free up some cash by selling individual invoices to some investors. Basically, this process takes the principle of P2P lending and applies it to invoice finance. This asset class provides the opportunity of getting higher returns compared to the ones offered by corporate bonds or loans. However, investors should always bear in mind that if something pays high interest rates, there must be a high risk attached. Some of the best invoice trading platforms are MarketInvoice and Sancus Finance. Equity crowdfunding is the process whereby people invest in an early-stage unlisted company in exchange of shares in it. The highest risk associated to this type of investment is the company failure. However, picking a promising startup allows to obtain huge returns. For this reason, an investor should study hard the product and its potential before participating to a funding campaign. Some of the most famous equity crowdfunding platforms are WeFunder and Seedrs. Real Estate Crowdfunding is the process where the capitals needed for buying shares of real properties are collected from a crowd of investors. Instead of purchasing entire buildings, investing in shares of real properties allows to receive a return on the capital without being involved in the regular management or day-to-day operations. The players belonging to this niche market are Fundrise and RealtyMogul.